What is it that makes a company a great place to work? Does your company give you the opportunity to win weekend breaks away, dinner up The Shard or even regular fun team drinks? Do they take you out to the races, treat you to pizza “just because” or provide champagne on every work anniversary? What about getting your birthday off work as an extra treat? If the answer to these questions is a ‘no’ then you’re not alone – it seems that not nearly enough companies these days are rewarding their staff for all their hard work. However, research shows that those companies who do invest in such perks are the ones who gain the most loyalty, productivity and enthusiasm from their staff. As we have been recently shortlisted as Employer of the Year in the South Coast Business Awards, we feel we have a good idea of what it takes to make a business a great place to work. Take a look at our top tips to make your workforce feel loved… because after all, a little love goes a long way. What your staff think about the senior leadership within the company truly matters! Inspiring, engaging and approachable leaders will bring out the best in your team. At Highfield, our two Directors sit amongst the team allowing everyone to get the best support and guidance possible. With such a strong senior team it is hard not to succeed. Everyone wants to feel like they are cared about and supported with their goals. Invest in your employees’ training and progression and not only will this improve their skills and efficiency, but they will feel valued, in turn improving loyalty and determination. We support our employees through apprenticeships and specialist recruitment qualifications, because we believe personal and professional development are imperative. Working with or for a team can have a huge impact on people’s moods and productivity. Team bonding and a well-managed team will significantly improve morale and everyone’s sense of belonging. 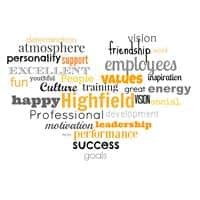 At Highfield we promote a friendly, relaxed and supportive atmosphere. Whether it’s helping each other out, or spending lunch breaks beating each other at table tennis, everyone encourages each other to do well. Want your staff to work to the best of their ability? Targets and incentives sure help this. We set weekly, monthly and quarterly incentives for our staff and have seen productivity and results shoot through the roof. It’s the people that help shape your company. Therefore, it is vital to listen to what they want and take on board innovative ideas. We are always looking at ways we can introduce new ideas and concepts that will improve the business and help our staff and our clients. We send out regular staff surveys and hold regular reviews where all employees have the opportunity to suggest any new ideas or concepts they think would be beneficial to the business.